We have been contending with unseasonable weather here in central Wisconsin -- in the 80s and 90s -- as well as the wonderful humidity that often accompanies temps like these. 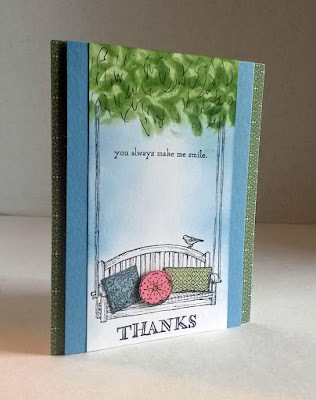 I thought that by sharing this cool and shady card, we all might experience some relief from the weather. Don't you just feel drawn in to sit under this leafy bower and relax among the pillows? Maybe Mr. Bird would even stick close by to keep you company . . . The looks of this card is very deceiving. It appears to be a tall and narrow card, doesn't it? Just an optical illusion, as it measures the standard 4 1/4" x 5 1/2". It must be that wide expanse between the tree branches and the swing seat that gives it that feeling. The bower was a struggle for me to design. I still am not sure it is a success, but my husband and my Stamp-In girls liked it. Anyway, to get the leafy effect, I sponged Wild Wasabi through a retired leafy-looking mask that Stampin' Up! carried a few years ago. I kept moving the mask around and sponging so it would look a little more natural. When I finished the sponging, I still didn't like the look. So I drew in some vague leaves. 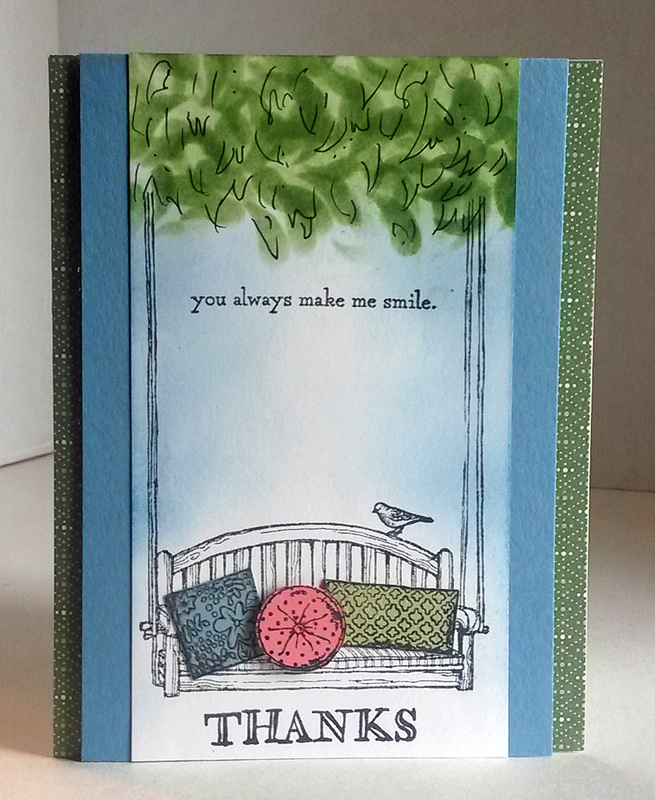 At my Stamp-In workshop, I told the girls that for this card, they could do a little Interior Design. Ahem, Exterior Design. I set out a basket filled with bits and pieces of cardstock, and allowed them to choose their colors. Using the pillow stamps from the set, Sitting Here (page 55), the girls then added designs to their chosen swatches. The square and rectangular pillows needed to be fussy cut (easy! ), but the round pillow could be punched out using the 3/4" Circle Punch. The two end pillows were merely adhered to the swing, while we used a Stampin' Dimensional to pop up the round pillow. Looks really REAL, doesn't it? . . . 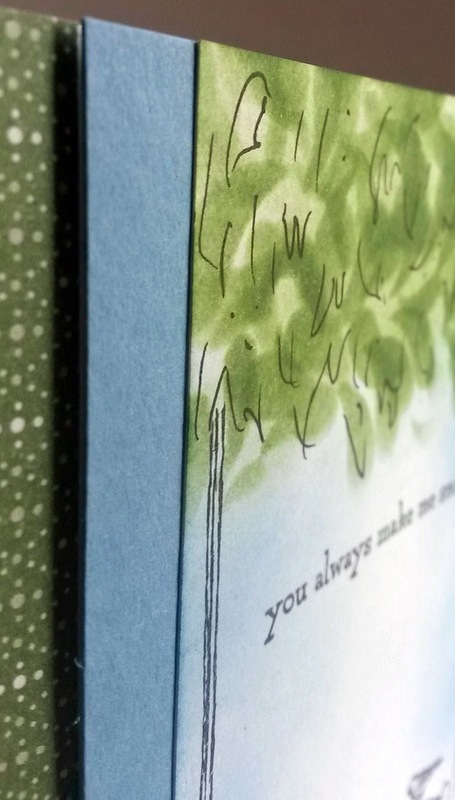 Narrow strips of Wild Wasabi-colored Designer Series Paper decorated the side edges of the card, while the main portion was popped up over them. Would you like to try your hand at re-creating this card -- just to get you through the summery autumn days? Check out the instructions below. 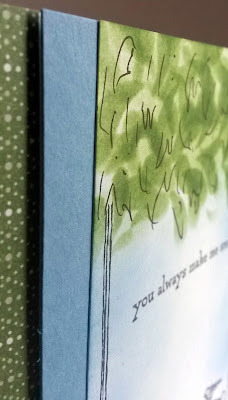 Add 1/2" strips of Wild Wasabi Designer Series Paper along the fold line as well as along the long opening edge. You will be doing your main work on a 3" x 5 1/2" piece of Whisper White cardstock. Start with the leaves on the top. Using the leafy-looking mask, sponge through with Wild Wasabi, moving it several times to make it look as leafy and natural as possible. You will be using up about a 1 1/2" to 1 3/4" at the top of the piece. 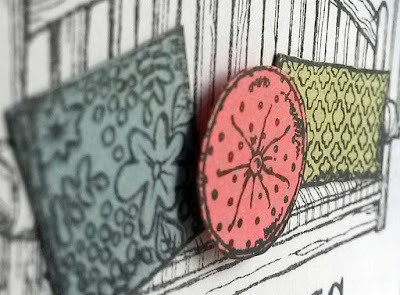 Once you are finished sponging through the mask, use a Basic Black Stampin' Write Marker to draw in the illusion of leaves. Stamp the swing so it looks like it is coming out of the leaves. Stamp the bird on the back of the swing. Choose three colors for your pillows. Stamp the pillows and cut out the square one and the rectangular one. You can use the 3/4" Circle Punch on the round pillow. Arrange the pillows on the swing seat. You can use Stampin' Dimensionals to pop up any of the pillows you'd like. With the sponges, sponge Wild Wasabi ink along the edges with the leaves, followed by the remaining side edges in Marina Mist. 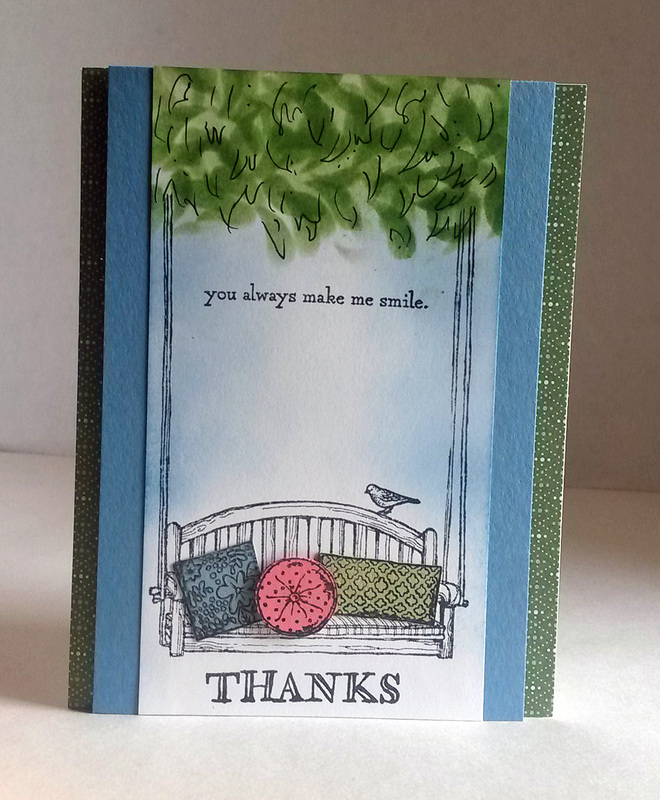 Stamp THANKS at the bottom in black ink. What a lovely card!! I think you did an excellent job on the leaves! Super cute! I love the dimension. Thanks for sharing with SYC. Linda, I think every card you make is beautiful. You are very artistic and talented. This card makes me want to sit down on the bench and rest awhile! 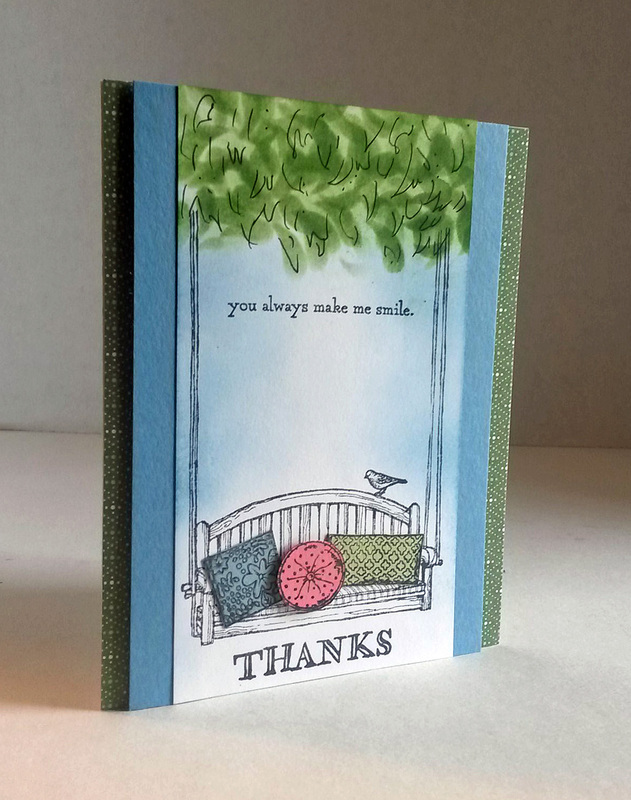 Thank you so much for sharing this at the #BoggingGrandmothersLinkParty. I've pinned and shared this! 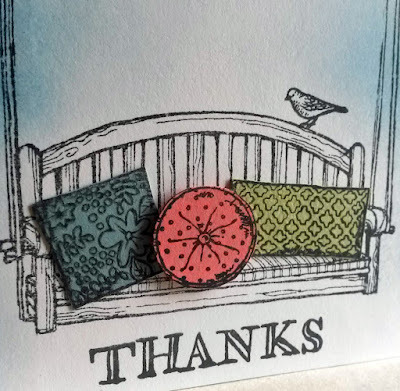 Such a pretty card, I love how you have lifted the one cushion. The sentiment is really sweet too. It really does look taller doesn't it!